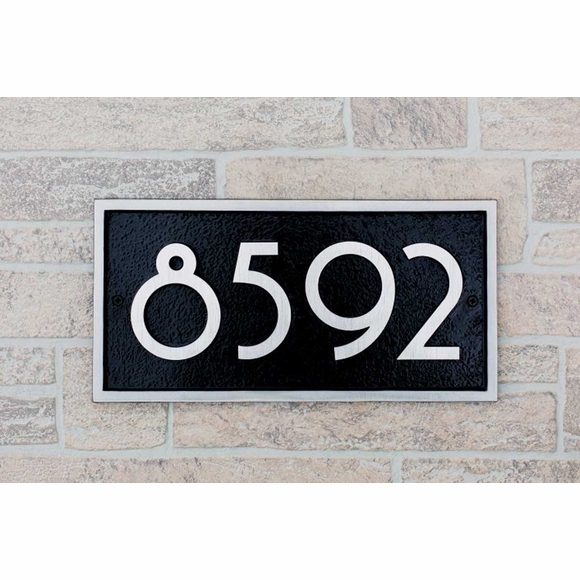 Rectangle Shape House Number Sign - - with one, two, three, or four 4" high numbers. Hand-crafted cast construction with powder-coat finish. Made in USA. Finished with a UV-stable polyester powder coat that is designed to withstand the harshest of elements. Will not fade, chip, or peel like the inferior painted plaques that you see on the market. Powder coating was developed to perform better than paint, especially in coastal regions where salt has proven to be the number one enemy. With three font options and four color options, the rectangle plaques shown here are truly one-of-a-kind and made specifically to meet your needs. Font selections: traditional (AT), modern (AM), designer (AD). Large image shown with modern font. Dimensions: 14"W x 7"H; weighs 2 1/2pounds. Rectangle Shape House Number Sign with one, two, three, or four 4" high numbers. Hand-crafted cast construction with powder-coat finish. Made in USA.